After playing a disappointing round of golf yesterday morning, I spent much of the rest of the afternoon completing phase 2 of the fire pit project. Phase 2 began with the installation of posts to hold strands of lights. 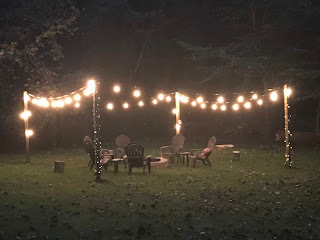 It also meant installing an outdoor electric outlet using the line formerly providing light to the now gone horseshoe pits. Yesterday Chris and I completed phase 2, we installed the lights onto the poles. They look great. 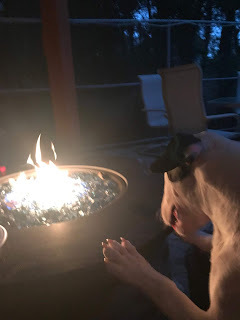 We were excited about sitting around anther fire, but since we are dog-sitting we chose to relax around the propane fire pit on the pool deck. It was very exciting as Rex, Patrick's dog, chose to check out the flame. He was not injured in the incident. And now, on to phase 3, creating a pad around the fire pit to finish off the project. This will be considerably more work, but I expect to get it completed in a few weeks. Autumn has not yet fully arrived in the region. We are enjoying 80 degree days and 60 degree nights. We should have many more weeks to use the pit and with all of the wood available from the felled trees, we have plenty of fuel available.